Die Ananas hat, was wir alle gerne hätten: Geschmack, Duft, Süße, und ein unverwechselbares Äußeres. Durch ihr markantes Aussehen und sicher auch, weil sie damals eine Rarität war, ziert die Ananasform viele Bauwerke. 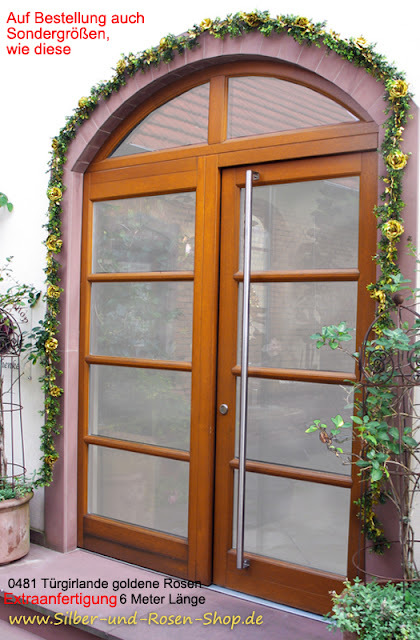 Als Pfostenaufsatz oder als Stuckdekor oder, wie in diesem Fall, sogar als Kuppel eines Hauses. Das "Dunmore-Pineapple" ließ sich der 4. Earl of Dunmore in Schottland als Sommerhaus bauen. Die imposante Kuppel ließ er 1771 dazufügen, nachdem er aus Nordamerika von seiner Tätigkeit als Gouverneur in Virginia zurückkehrte. The pineapple has what we all would like to have: taste, aroma, sweetness, and a distinctive look. Through their striking looks and certainly because she was a rarity at the time, the pineapple shape adorns many buildings. As post attachment or as stucco or, as in this case, even as the dome of a house. The "Dunmore Pineapple" was build for the 4th Earl of Dunmore in Scotland as a summer home. The imposing dome was add 1771 after he returned from North America from acting as governor in Virginia. Ich erinnere mich gut, wann ich meine erste Ananas sah. Weihnachten 1960 erreichte uns eine große Überseekiste. Ein Geschäftsfreund meines Vaters hatte die geschickt. Als wir sie öffneten, lag darin in viel Holzwolle gepackt eine große Ananas. Ich kann mich nicht erinnern, damals frische Früchte im Handel gesehen zu haben. Übrigens gehört die Ananas auch zur Weihnachtsdekoration der historischen Stadt Colonial Williamsburg in VirginiaUSA. I remember well, when I saw my very first pineapple. Christmas 1960, we received a large overseas box. A business friend of my father had sent it as a Christmas gift. When we opened, it was in a lot of wood wool packed a large pineapple. I can not remember having seen then fresh fruit before in a store. By the way, the pineapple ist also part of the Christmas decoration of Colonial Williamsburg/Virginia. Die Ananasfrucht ist schon optisch ein Highlight für jede Dekoration. Auf dem Buffet bei Obst und Desserts ist die ganze Ananasfrucht ausgesprochen attraktiv. Da hat man sofort Assoziationen zu den Tropen, zu Wärme, Licht, Sommer und Überfluss. Dabei sind die Ananas zur Zeit wirklich supergünstig im Handel. Diese günstige Gelegenheit muss man einfach ausnutzen. 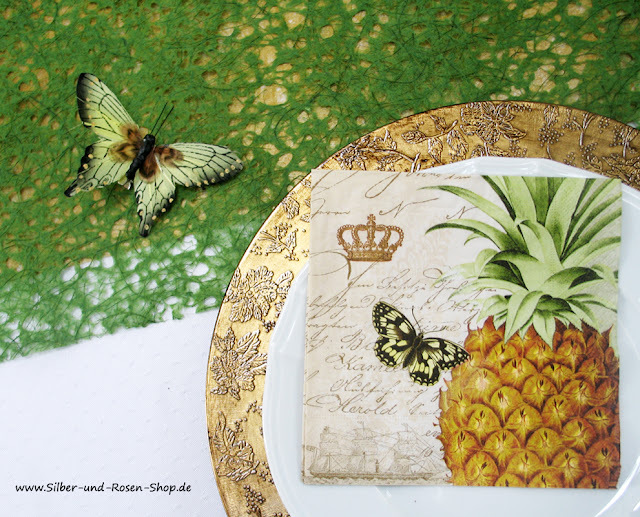 Bevor wir die Ananas zu allerlei leckeren Sachen verarbeiten, kann sie schon mal 1-2 Tage als Dekoration aufgestellt werden. Zum Beispiel mit Kerzengläsern in einer schönen Schale. Orchideen (aus Kunstseide) und Deko-Schmetterlinge (aus Federn) ergänzen das Set. 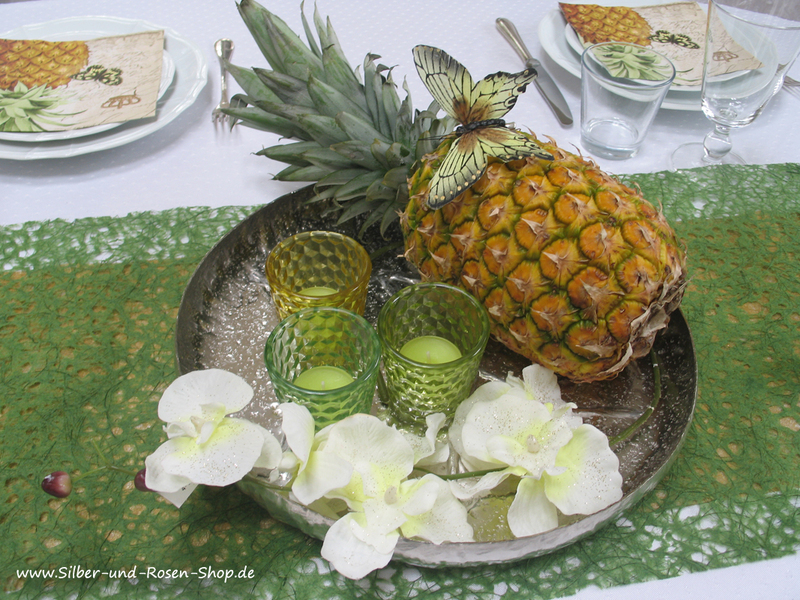 The pineapple fruit is already visually a highlight for every tablescape. In the buffet of fruit and desserts the whole pineapple fruit is very attractive. Since you have immediate associations to the tropics, to heat, light, summer and abundance. The pineapples are currently really extremely cheap to buy. Just take the chance of this opportunity. Before we process the pineapple to all sorts of delicious things, it can be placed as decoration 1-2 days. For example, with candles glasses in a nice bowl. Orchids (rayon) and decorative butterflies (of feathers) complete the set. Auf die Idee gebracht hat mich diese Papierserviette. Auf ihr ist vereint, was die Geschichte der Ananas hergibt. Christoph Columbus soll sie entdeckt haben, als er in Diensten der spanischen Krone stand. Mit Seglern wurde die Frucht Jahrhundertelang nach Europa gebracht. Das deuten die alten Schriftzüge, die Krone und die Skizze eines alten Seglers an. Als Tischläufer habe ich ein goldenes Metallicvlies und ein grobes grünes Papiervlies übereinandergelegt. 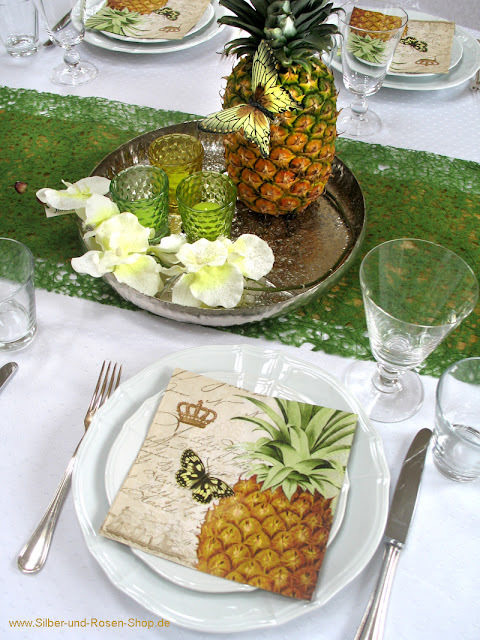 This napkins inspired me to an Pineapple Tablescape. Christoph Columbus should have them discovered, when he was in the service of the Spanish crown. With the sailors the Pineapples was brought to Europe for centuries. 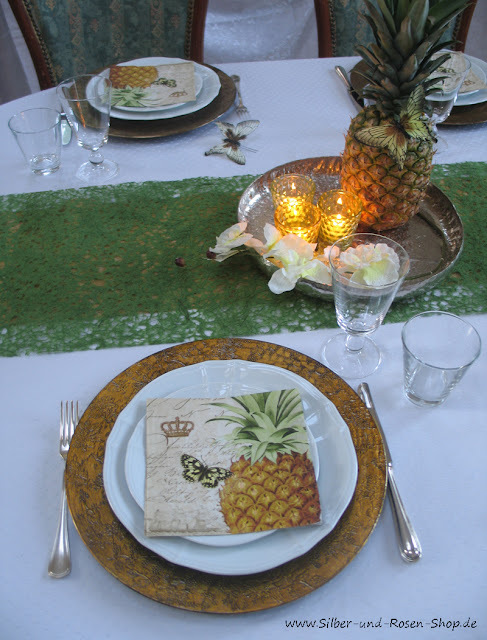 All symbols of the Pineapples history, the fruit, the ancient writing lines, the crown and a sketch of an old sailor, are shown on this napkins. As a runner I used a golden metallic fleece and a coarse green one. Sieht das nicht sommerlich aus? Ein Abendessen im Kerzenlicht bekommt noch mehr Glanz und Farbe durch die goldfarbenen Kunststoff-Platzteller. Und auch das Menü könnte Ananas enthalten, z. 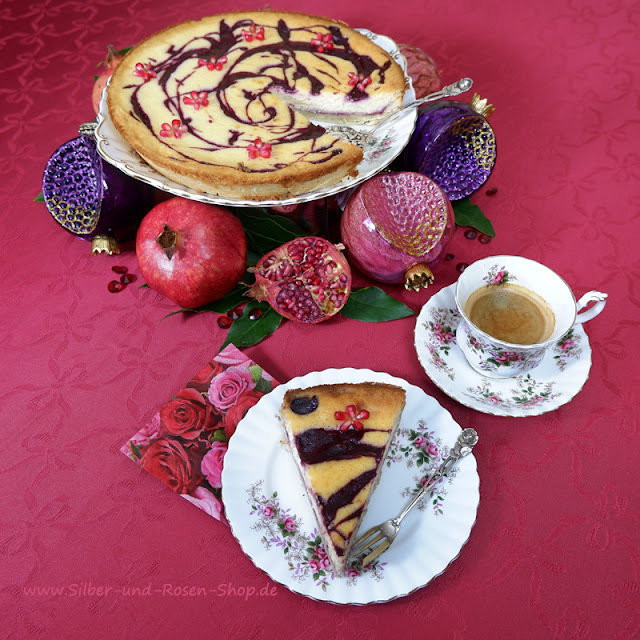 B. ein Reis-Curry mit Ananas oder halbierte Babyananas, gefüllt mit Shrimpssalat.Ein Kuchenrezept mit frischer Ananas folgt im nächsten Post. 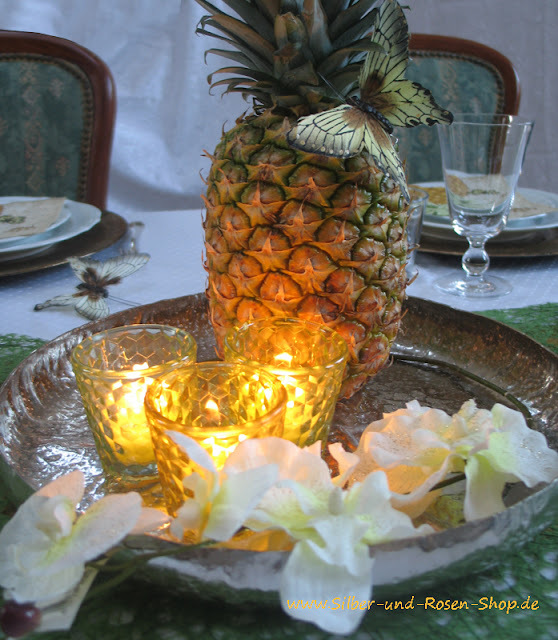 A candlelight dinner gets more shine and color by the gold-colored plastic dinner plate. And the menu could include pineapple, z. B. a rice curry with pineapple or halved baby pineapple, filled with shrimp salad. A recipe for a cake with fresh pineapple I will share with the next posting. Ich wünsche euch einen schönen Abend mit Kerzenlicht, Musik, netten Freunden und gutem Essen. I wish you a nice evening with candlelight, music, nice friends and good food. Welch ein wunderschöner Posten mit tolle Erinnerungen an deine Jugendzeit wo die Kiste mit Holzwolle + Ananas ankam bei euch. So etwas vergißt man nie im Leben. Ja die Deko Idee ist super so mit den Servietten. 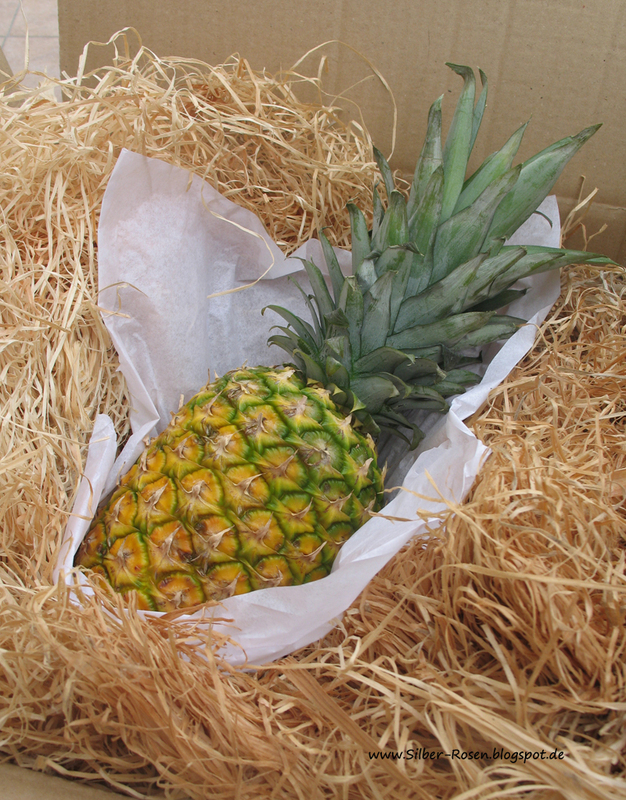 That is a wonderful memory of your father's friend sending a pineapple for Christmas. It would be a delight having never seen one before. They really do make a wonderful centre piece for a dinner table and of course the fruit itself is delicious. My son almost always buys a pineapple to eat here at home when he comes. I like pineapple with cottage cheese or in a salad for lunch sometimes. Your table looks lovely. 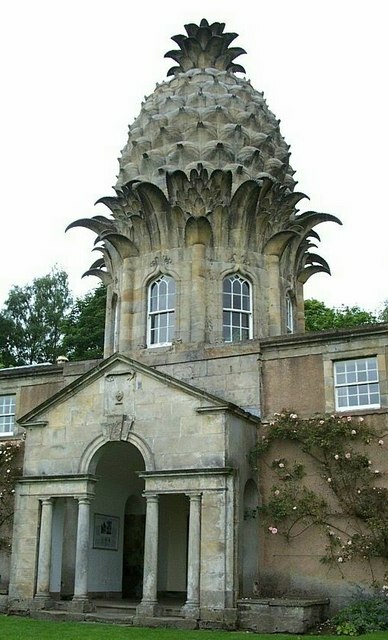 I am amazed at the pineapple edifice on top of the house in Scotland. 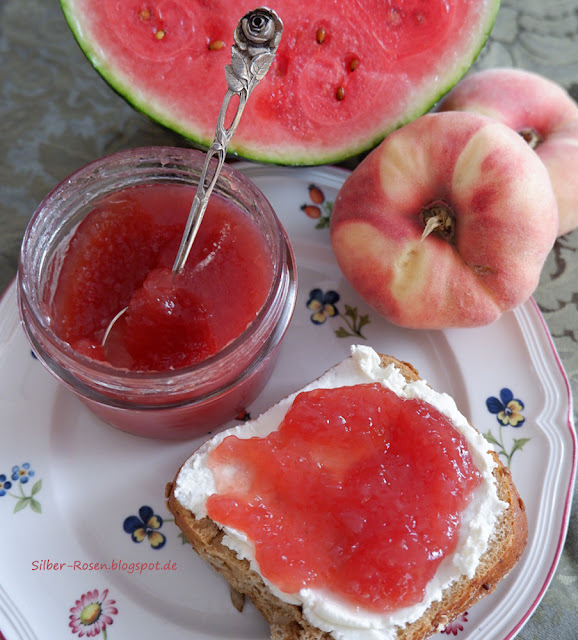 Thank you for sharing your interesting post with us and Happy Summer, Johanna. Yes - I have to say - the roof on that building is amazing shaped like a pineapple. We had pineapples as a motif where I grew up in Virginia as a symbol of hospitality. I think they still do that there but it was especially popular during the 70's. I remember I had a Pineapple door knocker. You photos are so lovely Johanna. Hope you are doing well. Thanks for sharing and linking this lovely post. It is lovely to be stopping by for a visit with you today! It has been ages! Your pineapple post is so interesting. I have never seen architecture like the building you share. I have seen pineapples carved on furniture. That is interesting too about Williamsburg. I have been there but didn't know. Your themed tablescape is wonderful!